According to a 2003 German time-use study, informal learners with the highest education levels learn because they love to learn. 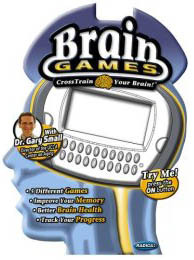 If you’re not quite there yet, or if informal learning seems like a sort of like a ‘eat your veggies’ exercise, then you might benefit from ‘Brain Age’ for the Nintendo DS player, or the handheld game called, ‘Brain Games’ from Mattel’s Radica division. Both Brain Games and Brain Age occupy a ticklish position. Both purport to be based on honest-to-Pete science. Both suggest that a regular diet of the mental exercises included on them will help keep your brain strong and young. Brain Age goes so far as suggesting that regular use could help you lower your brain’s age. Get it? Both cost around $20 in electronics retailers and the mass merchandisers. Nintendo’s Brain Age, by far has the better buzz. Radica makes handheld games like Solitaire, Suduko, a 20-questions game called Q, and the like, so this is a natural line extension. Nintendo looked at the numbers and bet that there was a market for adult learners. So far the bet’s paid off wildly. Brain Age was one of the top 10 video game sellers in 2007 and sold some 4 million units in 2006. Brain Age runs only on Nintendo’s handheld DS player, which starts around $130. Radica’s Brain Games is self-contained in the $20 unit. The criticism of this approach to informal learning can be summarized in the American idiomatic expression ‘teaching to the test.’ It means learning not much more than you need to pass a test. I think there’s more to Brain Age and Brain Games than the practice effect. But to explain why please indulge a personal anecdote. When I went through Army basic training my drill sergeants explicitly ‘taught to the test” when it came to the 2-mile run, 1/3 of the Army’s fitness test. We did very few long slow runs. There wasn’t time in the training schedule for that. Instead we did sprint work and more 2-mile runs on the track behind the barracks than I could possibly count, always timed by a stopwatch. Surprise, surprise, my final 2-mile time was several minutes below my first time. Teaching to the test helped me do dramatically better on the test. At the end of basic training I went directly to advanced training, which was less regimented. We seldom did physical training in groups, although all the fitness tests were conducted that way. So to stay in fighting trim I began to run around a course that had several possible mileages depending on the paths you took. What I found was that the base of fitness I had acquired in basic training… while training to the test… enabled me to become a fair runner. During my 13 weeks in advanced training I got to the point where I could easily run 8-10 miles at a time, further if I choose. My 2-mile run time dropped even further. When it comes to informal learning teaching to the test is problematic if that’s where you stop. But if you treat Brain Games, or Brain Age like an ingredient in the mole and not the whole enchilada, than either one could be a nice addition to your learner’s toolkit.